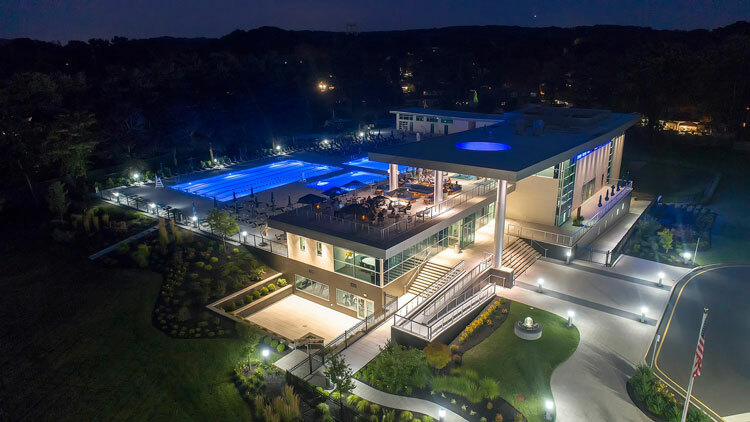 Dresdner Robin completes design work on The Cambridge Club in Monmouth County, N.J.
Aberdeen, N.J. — Dresdner Robin, an engineering and land-use consultancy, completed design services for The Cambridge Club, a new recreational facility in Aberdeen. The inclusive, family-oriented club sits on approximately nine acres of land and offers a year-round resort-like atmosphere for members and guests. The Cambridge Club amenities include a 25,000-square-foot clubhouse with a fine dining restaurant, 5,000-square-foot pool pavilion building, rooftop deck, lounges, fitness area and spa. Outside there are seasonal dining options, as well as a yoga lawn, playground, and two-acre recreational fields for kids and adults. Water features include a six-lane, 25-meter competition pool, zero-entry activity pool, heated therapy pool, oversized 20-person jacuzzi, children’s pool and 2,000-square-foot spray park. Dresdner Robin coordinated with architectural firm Fabiano Designs to transform the former Strathmore Bath & Tennis Club, built in the mid 1960’s, into a modern, inclusive first-class recreational facility. “We are very proud of the work we performed on the Cambridge Club, which included landscape architecture, construction administration, engineering consulting and surveying services. The owners of the facility, Frank and Tammy Ward, spent their summers here at the old swim club and had a grand vision of what they wanted The Cambridge Club to be. It was a pleasure working with them to turn that dream into reality,” says Mark Vizzini, Project Manager, Dresdner Robin. “We developed a site-sensitive layout that preserved significant amounts of existing vegetation and installed many diverse plantings around the site. To improve water quality and accomplish zero stormwater runoff, we minimized paved parking by providing grass-covered overflow parking areas,” says Lauren Venin, Landscape Architect, Dresdner Robin. Dresdner Robin’s engineers adhered to strict American with Disabilities Act building requirements to make the club easily accessible for all patrons. Owners Frank and Tammy Ward have a daughter with Down syndrome and dreamed of opening a club environment where anyone with a disability would be welcomed and given equal opportunities. Since opening in July 2018, the club has attracted nearly 300 members and fielded more than 1,000 inquiries. It has hired a dozen full-time and 60 part-time employees for accounting, client services, lifeguarding, maintenance, social media and server positions. The site and buildings were designed with future expansions in mind. Phase two will consist of a 5,000-square-foot young adult area, an outdoor performance stage and 5,000 square feet of event space. Phase three will include an indoor aquatic center and expanded health, wellness and spa facilities. To learn more about the Cambridge Club, visit www.cambridgeclubnj.com.